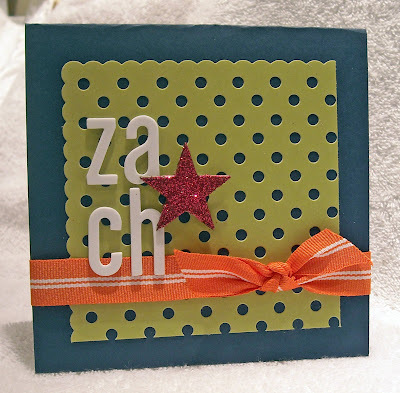 Today's tip - Use patterned paper, simple images, and single layers for quick and easy card creation. This is a card I created for Mother's Day, a day I needed four cards for two Grandmothers, a MIL, and a step-Mom. 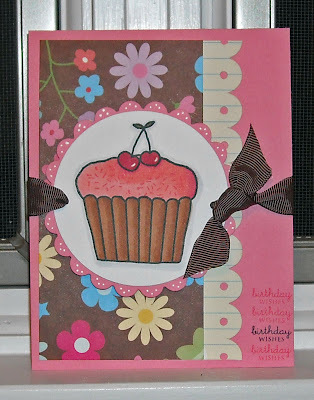 I was able to quickly cut patterned paper for the bottom of the cards, leaving the top plain. Next a ribbon, tied in a knot vs. a bow (which for some of us takes a lot more time) around the card front added an extra pop of color. The leaf image, from a new Stampin' Up! set, was stamped on each of my pieces of pre-cut white card stock before stamping the floral image. I quickly colored the flower with watercolors and then mounted the image on one layer of color coordinating cardstock. My last step was to stamp the sentiment four times on white cardstock and then to punch them out with a 1 3/4" SU! punch. The fun scalloped circle is also a punch from SU! so it was super fast to punch out four circles and finish up my cards! Enjoy this week's simple card! Today is Johanna's, creator of Odd Bird Planet stamps, and I'm sending along heartfelt wishes for a very joyful and happy birthday! This week it was my turn to set the challenge for the SALT team and I chose a topic that I've been thinking about lately, the Holy Spirit and how He works in the life of believers. My primary reason for thinking about this topic is my own struggle with remaining sin and how often I face these struggles, unnecessarily, on my own because I fail to ask for help from the One Jesus promised to send after He ascended into heaven – the Holy Spirit. My Reformation Study Bible notes the following, “The work of the Spirit is to glorify Jesus Christ by showing His disciples who He is (John 16:7-15) and what He means to them (Rom. 8:15-17). The Spirit enlightens (Eph. 1:17, 18), regenerates (John 3:5-8), sanctifies (Gal. 5:16-18), and transforms (2 Cor. 3:18, Gal. 5:22, 23). He gives God’s people what they need to serve Him (1 Cor. 12:4-11)." I'm encouraged by the idea of being transformed from who I was outside of Christ. Galatians 5 tells us that the works of the flesh are well known to us; jealousy, envy, selfish ambitions, etc. However, as a Christian we have the Spirit that works within us to change us into those that are filled with joy, peace, love, goodness, faithfulness, and self-control. How exciting to know that God, through the work of the Holy Spirit, not only brings about lasting and dramatic change in the life of a believer, but ultimately gives us victory over our remaining sins! We hope you enjoy the beautiful work the design team has created for you this week on the SALT blog. Please, if you're inspired by this week's topic, leave us a comment. And if you create something based on the topic, leave us a link back to your blog or gallery...we'd love to see your creations! 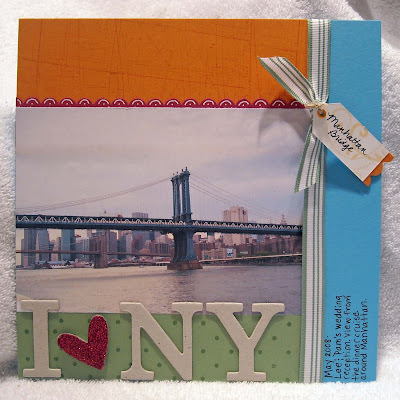 Scrapbook page notes - Since we just finished the move into our new house, all of my stamping goodies were still packed when it was time for me to create something for this week's challenge. Therefore, I went digital! I'm still learning all the ins and outs of digital scrapbooking so there's a part of me that's itching to add more to my page, like stitching around those small squares, but I have no idea how to create that look yet! :-) I decided to use a picture of a cocoon and butterfly for a visual of the idea of transforming. It's an amazing part of creation to see a not so attractive caterpillar turn into a beautiful butterfly. In the same way, the Holy Spirit works within us to transform us into God-loving individuals! May Issue of SNR - Just Ducky! The May issue of Scrapbook News & Reviews was released just a few days ago and it's chock full of amazing samples and informative product reviews, techniques, articles, and videos! If you haven't poked around on the SNR site, now is the time! You're going to love what you find! I have a few cards published in this month's pub, most have been posted on my blog over the past few months, but I've been waiting to post this card, sporting an adorable A*Muse duck image. I created the blue circle paper using a retired Stampin' Up! set. 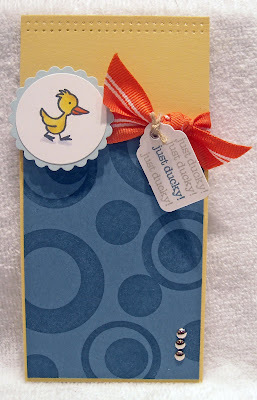 The ducky was colored with Copics and I stamped the "just ducky" sentiment four times on the tag, highlighting one of them in a bright blue. 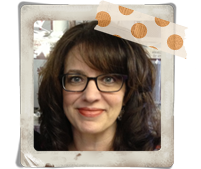 The ribbon and brads are also Stampin' Up! Be sure to check out this month's issue of SNR! Did you know that you can sign up for an entire year's subscription for only $49.99? And that's not all...you can even sign up for just a two month subscription for a mere $7.99! There are so many options...head on over and check things out! Enjoy! Has anyone noticed that I have a thing for American Crafts foam letters? Good gracious, I love those things! And they make for quick and easy card making! My favorite thing when working with a packed schedule! Here's another graduation card, seeing as it's that time of year. This super easy card was creating using my favorite Papertreyink set, Life, my favorite patterned paper from Crate and my favorite foam letters! The frame was created using two square Nestibilities dies. I cut a larger square out with my Cuttlebug and then used the next smaller square to cut a square out of the larger square, leaving behind a frame (does that make any sense? LOL!) The floral images were stamped inside the frame and the letters were added on top. Easy peasy! Oh, and a couple of fun notes: -I'm going to summer CHA!!! I'm so excited! Julie Masse and I are going together and we can't wait!! -The June issue of Scrapbook News and Reviews will be out shortly...I have a card published in the June issue and a product overview article on Odd Bird Planet stamps. -I finally have Internet service at the new house! That is just about the most exciting thing yet! hee hee How did we ever live without the Internet? ;-) Have a wonderful evening!! We're in our new home!! Although it's not technically ours yet...confused? Yeah, we were yesterday at our closing as well. Turns out our sellers failed to get part of the deed from our land settled with the town. Translation - we didn't actually buy our house yesterday! Talk about a tense three hour meeting...Thankfully, the sellers allowed us to move into the house anyway with the understanding that we'll close in another week. So right now we're calling ourselves squatters since we're living in a house that doesn't belong to us! LOL! It's been an interesting couple of days! After two days at two different hotels our boys are now snug in their beds...Our youngest kept asking where our house was and why someone else was in our (old) house. 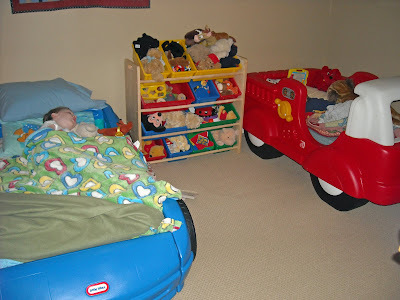 He spent the first hour in our new house playing in his firetruck bed. I think they're both relieved to see their belongings again and finally have life almost back to normal... Stamping will be on hold for a bit as it will take me some time to unpack all of my goodies, however, I managed to get a bunch of cards created before we moved so I'm looking forward to sharing! And it's my turn to set the SALT challenge next week so keep an eye out for the wonderful work of our design team! Well it's 9:30 pm here and I'm ready for sleep...Thanks for stopping by and have a wonderful weekend! Today we load the moving truck!! (Well, to be honest my husband and some big burly men will load the moving truck...I'll be tucked away at a cozy B&B with the kids!) Since we're "graduating" to another house, I thought I'd leave you with a graduation card. 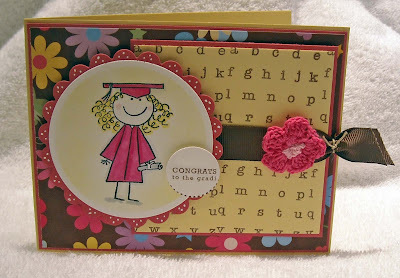 I thought this would be super cute for a child graduating from kindergarten, which my son will do in a few weeks (humm...maybe I should have made this a boy card!!) I can't believe five years have gone by already and he's on the verge of first grade...amazing! I'll be MIA for a few days while we get settled and before cable is hooked up so enjoy this card for a short season and I'll be back asap! (PS - I really miss stamping...can't wait to unpack some goodies!!) Happy Wednesday! Forget about those stamps! That's right, when you need a quick and easy card, forget about the stamps! And instead use chipboard, ribbon, and foam letters to create a colorful and fun birthday card for a 10-year old! The count down is on...just two more days until we move (ask me if I'm all packed...umm....no) and last weekend I needed a card for my nephew's birthday. Since my unpacked stamping supplies were limited, along with my time, I decided to create something super-duper fast. I simply applied the piece of green paper to a navy base, added some ribbon and letters (good thing his name has only four letters or I would have been in big trouble! LOL! ), and a chipboard star covered in red glitter. Time to complete - mere minutes! Now that's what I call simple... I think I hear boxes calling me so I'm off to keep packing...have I ever shared how much I hate packing? ;-) I'll be glad when we're re-settled again! Have a happy Monday! Part of my last Papertreyink purchase was a pack of their guideline paper, found here. This paper features very faint lines that enable you to perfectly line up decorative stamps, which is the perfect tool for helping you to create your own patterned paper! I had my eye on this paper since it was first released and I love it! It's so easy to use and I love the results. One of my favorite aspects of the PTI product line, outside of the amazing designs, is the cost. I don't know how they manage to keep the cost so low but you can purchase an entire pack of the guideline paper for a mere $3.00! 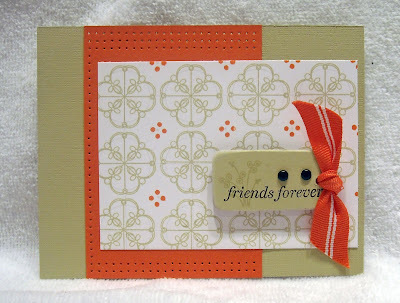 This was a quick and easy card, made after playing around with some background stamps, also from PTI. What's very cool about the paper is that after you stamp an image the guidelines, pre-printed on the paper, are nearly impossible to see and what you can see blends in perfectly. Very fun stuff! (I'll have to take some photos while I'm in the process of using the paper...) All of the other elements on the card are from Stampin' Up! Just a week until we move - oh my - so if I'm MIA for a few days you'll know why! Will be back with photos of the new place...filled to the brim with boxes I'm sure...once we get a little settled! Enjoy your Tuesday! Wishing every Mom out there a very happy Mother's Day! My two sweet boys (with a bit of help from Dad) surprised me with a vase full of beautiful flowers (and some hand picked dandelions from the backyard - how sweet!) and a homemade card. In the card, my oldest drew a picture of himself going to pick the dandelions! LOL! 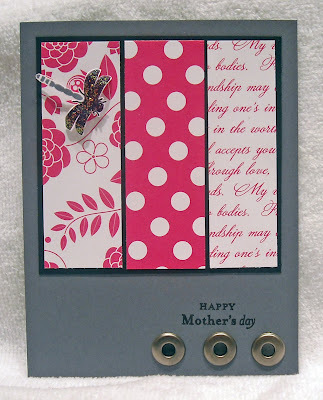 Today's card is not only a tribute to Mom's but to Papertreyink paper and stamps as well. I haven't purchased much from PTI lately, they have so many new and wonderful products that it's always too hard to choose! However, I had my eye on a stamp set and the new grid paper, announced next month, so I took the leap a few weeks ago and made a purchase. 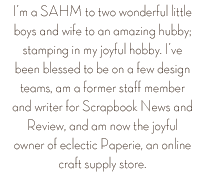 One of the items I bought was the patterned paper highlighted on my card. It's called Raspberry Fizz Mix and it is typically not a color I would go for but I just loved the designs so I went for it and I love it! The color is really vibrant and pairs wonderfully with deep tones and neutrals. I went for a grey/black mix on this card and since I really couldn't decide on which paper to use I used three of the patterns found in the paper pack! 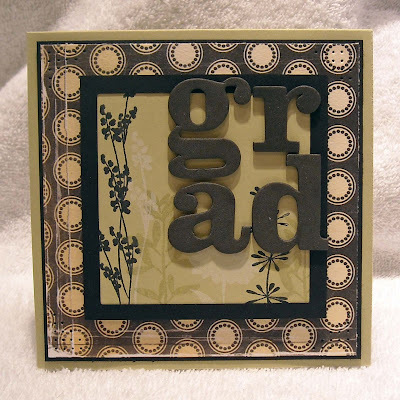 I then added a simple sentiment and three pewter grommets, from Stampin' Up!, at the bottom of the card. A dragonfly from the PTI set Pond Life was added as an accent on the patterned paper and the dragonfly's wings were adorned with a shimmery glitter. It's not your traditional Mother's Day card but it sure was simple and I love the look of those rockin' papers! Enjoy! I'm not a huge scrapbooker (although I totally appreciate those who are and love checking out their work!) but I do enjoy creating a quick and easy page every now and then. I've found that, for me, a 6x6 or 8x8 layout is the best. It's large enough to fit in one big or a few smaller photos and a few embellishments but it's not as overwhelming as a 12x12 layout. I can never figure out what to do with all that space! This was a layout I created for the travel section of a SNR publication. They didn't end up using it so I'm posting it here. This is a photo of the Manhatten Bridge, taken from one of those cruise ships my brother and SIL rented for their reception. They're just about to celebrate their one year anniversary so the timing of my post is well timed! They got married on a beautiful day in May last year and the boat cruise was a blast! Since part of my heart is in NY, I wanted to use the typical I *heart* NY logo on my piece. The heart is super sparkly, wish I was better at photographing those details, and the chipboard was left plain. 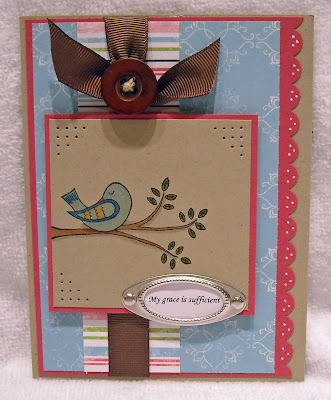 All materials used on the page are from Stampin' Up! Happy Thursday! Last year for Christmas my husband bought me a set of A*Muse stamps. I'm not sure where he found the set but I was A*Mused that he purchased such a popular line of stamps for me since I'm pretty sure he doesn't know one stamp manufacturer from another! This set of acrylic stamps is called Animal Wishes and comes with a number of adorable animals and sentiments. And a year has gone by without me ever even opening the package! How sad is that! Even worse, I came across the set while I was cleaning out my cabinets in preparation of our move, tucked way in the back. Poor neglected stamps! In my effort to use more of what I have, instead of buying new, I decided to ink up my cute stamp set and make a few cards. 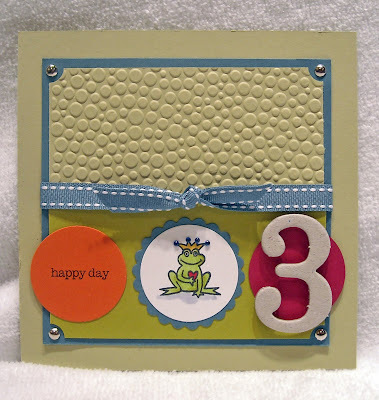 This is the first one I created, using this charming frog and happy day sentiment. Since our son's birthday is coming up in a month, I thought this would make an adorable third birthday card for him. Not that three year old can really appreciate the art of a handmade card! LOL! All supplies, other than the stamps and tiny rhinestones in the frog's crown, which are from Taylored Expressions, are from Stampin' Up! Why not challenge yourself to search for and use those forgotten stamps this week...You never know what you're going to find! Enjoy! This week's card comes in the form of a mini 4x4" card and I have to say that I just love this size card...it's perfect for quick thank you cards. 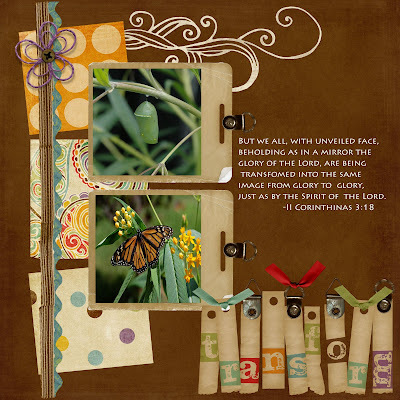 I'm still obessively using my Urban Oasis paper from Stampin' Up! and thought I'd like to make a card that showcased four of the patterns in this paper pack. Each square is approximately 1.25", mounted on a piece of white cardstock. The buttons are from Papertreyink (a fabulous collection of buttons, worth checking out! 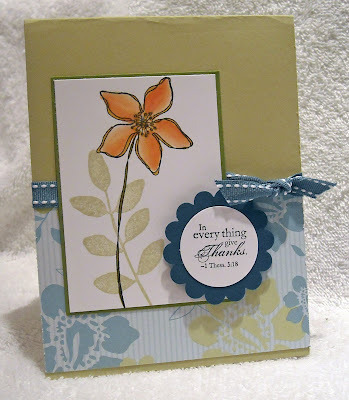 ), and the flowers are from Stampin' Up! I finished up the card by surrounding the entire square with some paper piercing and a sentiment stamped on a piece of paper ribbon. Enjoy!